It took great fortitude and all the character built by D of E and all those other things you do as a teenager that people in warm dry houses describe as character building to stay at work for the remaining 6 hours and not rush home immediately (or suggest H get on a train with the parcel and meet me for lunch). 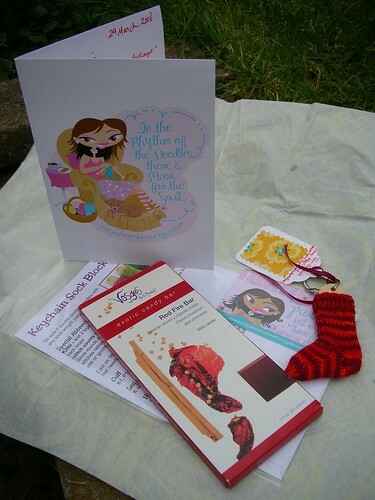 all of this – a lovely card, the tiny wee sock pattern, her blog card and CHOCOLATE!!! As Marisol is several thousand miles and an ocean away I have to send my thank you hug virtually but in all seriousness THANK YOU – I had a grotty day yesterday to finish off a stressful week and that was a wonderful surprise to come home to – above and beyond the swap requirements and I am very grateful. The yarn is Wolmeisse which I’ve never encountered before but I think I might just be on the start of the slippery slope. The colour is chilli red which I love and the chocolate is red fire. 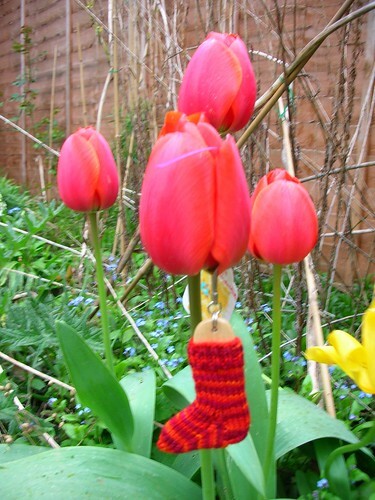 To continue the red theme, I brought the sock to meet a little red in my garden! 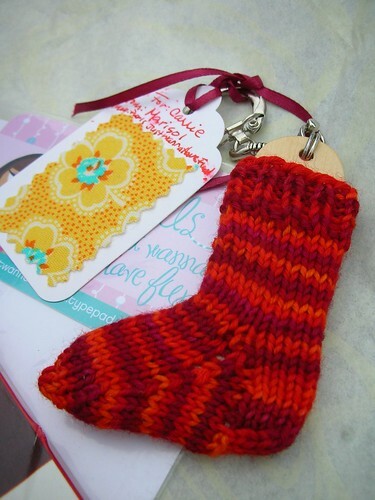 It’s been really great getting to know two new bloggers in this swap, Marisol and Amber so go and say hello to them!